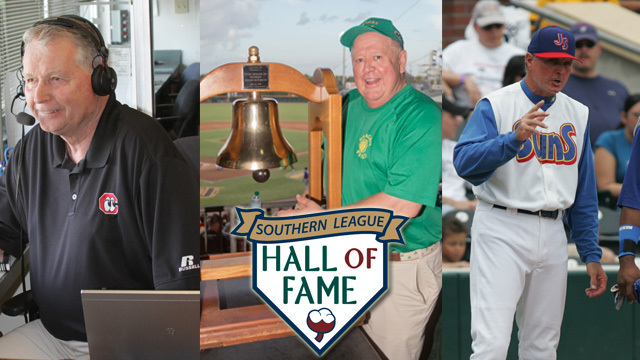 (Left to right) Larry Ward, Peter "Pedro" Bragan, Jr., and John Shoemaker will be celebrated as the Southern League Hall of Fame inductees at the All-Star Game June 21 in Pearl, Miss. JACKSONVILLE, Fla. - The 2016 Southern League Hall of Fame Class will place much of its spotlight on Jacksonville's unique baseball history. Among four inductees are former Suns owner and operator Peter Bragan, Jr., former manager John Shoemaker and former broadcaster Larry Ward, the Southern League of Professional Baseball Clubs announced on Tuesday. A panel of 30 voters chose the league's third induction class, which will also include Larry Schmittou. The inductees will be celebrated at the 2016 Southern League All-Star Game June 21 in Pearl, Miss. The induction of Peter "Pedro" Bragan, Jr., follows 31 years of the Bragan family's ownership and operation of the Jacksonville Suns. After his retirement, Bragan was named Southern League Vice President Emeritus in October. "I am most humbly appreciative to all who voted for me, and it is indeed a very special honor to be voted in where my Daddy and Uncle Jimmy are already enshrined," Bragan said. "I would like to extend thanks across the Southern League and especially to the great baseball fans in Jacksonville that have made Suns baseball such a special tradition." Bragan will join his late father Peter Bragan, Sr., in the league's Hall of Fame. The elder Bragan was inducted in the inaugural class of 2014. "This year's Southern League Hall of Fame Class highlights the tremendous tradition of baseball in Jacksonville," said Suns owner Ken Babby. "The Bragans' legacy is well known in Jacksonville, and Pedro's induction into the Southern League Hall of Fame demonstrates the impact he has made in the baseball world. He is extremely deserving of this recognition." Known simply as the "The Voice," Chattanooga's long-time radio broadcaster Larry Ward completed his 27th season calling Lookouts action in 2015. Notably, his most recent campaign brought with it his first Southern League Championship. The last time the Lookouts won the SL title came in 1988, the last season a broadcaster not named Larry Ward was the active man in the radio booth. The longest-employed radio broadcaster with the same team in the Southern League, Ward was elected to the Greater Chattanooga Sports Hall of Fame in 2005. Prior to his time in Chattanooga, Ward manned the booth in Portland, Tucson, Charleston (SC), as well as a stint with Jacksonville. During the offseason, Ward serves as voice of the University of Tennessee-Chattanooga Lady Mocs basketball program. ABOUT THE SUNS: A new era of affordable family fun will dawn on the Baseball Grounds of Jacksonville on Opening Day, April 7, 2016, with the Jacksonville Suns under new ownership. The Suns have already unveiled a new lineup of ticket packages for the upcoming season, and you can get part of the action by calling the Suns at (904) 358-2846 or visiting www.jaxsuns.com.